Central Jakarta Environment Sub-dept. 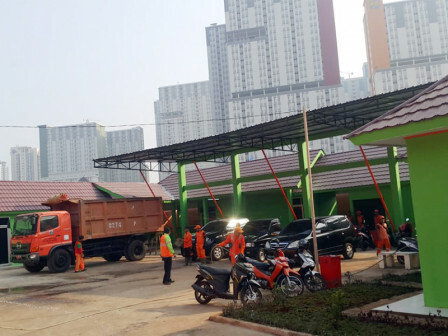 's Integrated Waste Management Location (LPS) located on Jalan Dakota, Kebon Kosong Urban Village, Kemayoran, starts to operate today.
" Currently we have closed those TPS and all waste is transported in here"
Central Jakarta Environment Sub-dept. Head, Marsigit said, Kemayoran LPS is built mainly to accommodate waste. Previously residents used to use dump waste in eight illegal dumpsites (TPS) along Sentiong River. "Currently we have closed those TPS and all waste is transported in here. This place will be also used to accommodate waste from Wisma Atlet during Asian Games," he explained, Friday (7/20). According to him, this 1,000 square meters LPS can accommodate around 300 cubic meters waste per day. It is targeted to process 70 percent from total accommodated waste. "We will process household waste into compost and waste bank similar to Gelora Bung Karno LPS," he added.